Addiction and mental illness are very serious issues. In this page we will investigate the challenges and the benefits surrounding rehabilitation and affordability, as well as finding free rehab centers for yourself or a loved one. If you or someone you know has an addiction or mental illness, we urge you to seek out rehab centers in your area to find a rehabilitation center near you. Free rehab centers, clinics, programs and treatment options are readily available in your area. Where Can I Find a Free Rehab Center? To find free drug or alcohol rehab centers, call our helpline at 800-481-6320. We’ll connect you with local treatment services that provide free or low-cost rehabilitation programs. Many programs accept insurance and require little or no co-pay at time services are rendered. In addition to our directory of free rehab centers, the Substance Abuse and Mental Health Services Administration can also direct you to local resources in your city or state that have free beds available for your recovery needs. For some, the monetary cost of treatment is simply too much to bear. You want to get help, you KNOW you need help, but you’ve called around and asked about treatment costs only to find that you cannot afford it. Let’s face it, many can’t afford thousands of dollars upfront for rehab. But did you know that insurance covers many costs associated with drug or alcohol addiction treatment? YES–it’s true! Insurance covers the cost of drug and alcohol addiction treatment under many circumstances. Recent changes in law have made access to insurance coverage for rehab more widely available. Most insurers cover drug or alcohol detox 100% and those that don’t offer complete coverage provide coverage rates similar to those for other mental health treatment services. The challenge in finding a free rehab center is that you must call each center individually and have your insurance checked. Calling our helpline toll-free at 800-481-6320 is the fastest way to find out if we can connect you with a free rehab center that will accept your insurance coverage. The call takes about five minutes to complete. Funding for free rehab programs varies. Some offer bare-bones treatment and have extremely limited space available for patients. Other programs provide similar accommodations to luxury rehab centers offering state of the art rehabilitation services and specialty programs that you would generally expect in a high-end rehabilitation facility. State-funded rehab programs generally cover a wide range of treatment options that can be individually tailored to meet the unique needs of each patient. Unfortunately, state funding only goes so far and these programs are often limited in availability. While many states provide treatment programs that DO result in recovery, it’s equally common for these programs to lack the core support services that are necessary to facilitate lasting healing. Free rehab centers are able to provide drug and alcohol rehab services at no cost to the patient. Families and friends of those addicted to drugs or alcohol can find free rehab centers to help their loved ones without placing any financial burden on them. Free rehab centers will usually provide all the same services as paid rehab centers except these services are provided completely free of charge. To find out if treatment may be free in your area, call 800-481-6320 and ask to speak with a RehabCenters.com specialist about free rehab options. There are many free rehab centers located throughout the United States. Many Christian rehab centers also provide their services to clients for free. Free rehab centers are non-profit facilities that are not trying to make money off of another person’s struggles, addictions or problems and usually operate on donations or on community grants. Free rehab centers provide counseling, therapy, and medical services. Drug addicts can seek addiction treatment at free rehab centers. Free rehab centers offer addicts a safe place to detox and to recover from addiction to alcohol or drugs. Group counseling and individual therapy may both be used to help addicts regain control of their lives. 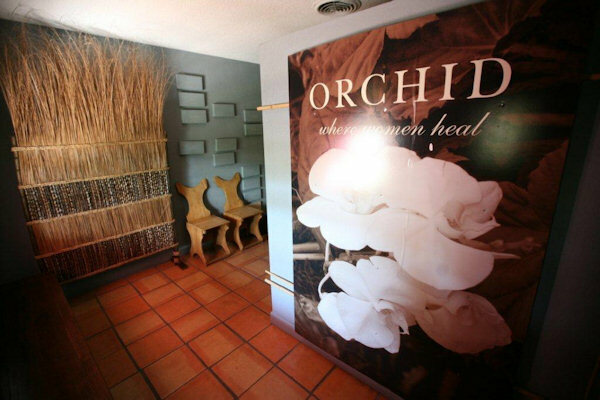 Care and specialized treatment are provided by certified therapists and drug counselors at free rehab centers. These non-profit centers can provide complete care for a range of addictions and conditions including drug addiction, alcohol addiction, sexual addictions and various mental conditions. 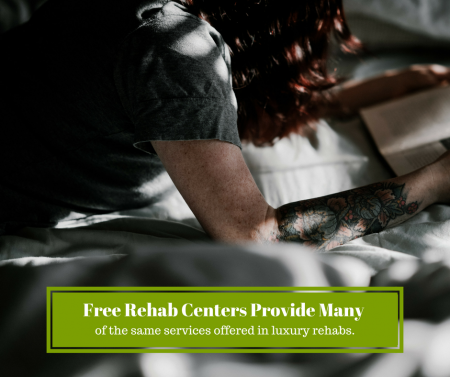 The services offered at free rehab centers are comparable to those that are offered at many for-profit rehab centers. Free rehab centers can help people who have mental conditions such as depression or anxiety by providing behavioral therapy or cognitive behavioral therapy. These two therapy types will help an individual to cope with mental conditions and other issues that cause the depression or anxiety in a way that creates a positive outcome. Free rehab centers have specialized psychiatrists and psychologists that can successfully treat many mental conditions. Free rehab centers provide high-quality treatment for a range of addictions and mental conditions. These non-profit centers allow the individual to focus 100% of their time and efforts on recovery from illness or addiction rather than having to worry about how to pay for treatment. 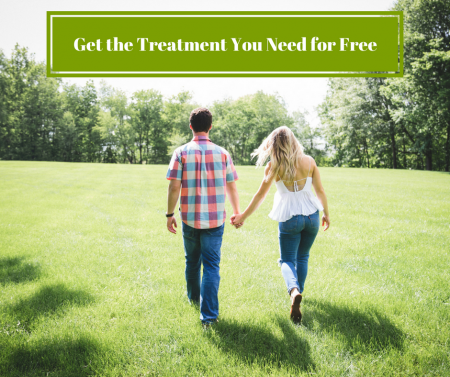 Free rehab centers take all the worry out of paying for treatment. Individuals who otherwise would not have sought treatment solely because they do not believe that they could afford it can now seek solace at one of many free rehab centers. Addiction and other disorders are not prejudiced, they will strike any person of any race, color, social disposition, or wealth. Free rehab centers offer help for those who otherwise cannot afford the specialized treatment and care that they need to get well. At many free rehab centers, accommodations are provided that allow for 24-hour care and shelter. These inpatient rehab centers allow patients to stay for 30, 60 or 90 days or even longer and provide additional counseling and therapy that can help the individual to successfully recover from their addictions. Spots may be limited at some free rehab centers but it’s vitally important for those who need help to actively seek the care that they deserve in order to live drug-free. Most free rehab centers operate with community funds or grants. Free rehab centers may coordinate meetings and group counseling services for those who do not require inpatient care. Community resources that are free of charge such as drug and alcohol education, interventions and long-term drug treatment may all be offered by free rehab centers. Free rehab centers provide an effective way for addicts and their families to cope with addiction. Treatment programs are tailored to best serve the individual and to help them to recover. Free rehab centers will provide all services including consultations free of charge. Families and loved ones do not have to worry about how they can afford to provide the care that is needed to suit their loved one’s needs, free rehab centers provide help for these families.